With these results has been decided to seek other fuel that could solve these problems. During 4 years we have researched and developed a stove that is capable of generate the same or better performance that gas stoves have and could solve the drawback of accessibility to gas in rural areas and areas far from cities. To that end we developed a stove that works with vegetable oil, whose characteristics are presented below. 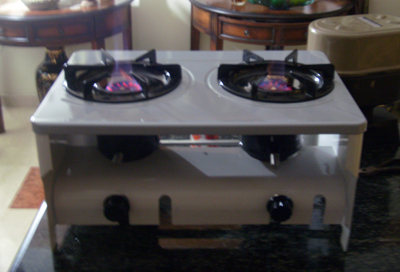 Aristo is a 2 stove burners that operates using all kinds of vegetable oil. The most known types of oils are Higuereta, jatropha, Camelina, African palm. They can also be used cooking oils made of soybean, maize, sunflower, although these are not desirable because of its high cost and are also products consumed at home. Another excellent option is the use of used cooking oil, which has a high performance at low cost. The stove oil has a good performance on fuel consumption. 4. Do not emit toxic gases. 9. It reduces the import of liquefied gas which would generate large benefits to the country. 10. They can be used as heaters in cold regions. 11. This produces a savings of up to 70% in costs compared with gas. 12. It helps preserve the environment by reducing the felling of trees used as firewood for cooking. 13. The oil stove is much more economical than a gas stove.